Whether you want to give customers or employees - this tram will bring you to your destination guaranteed! 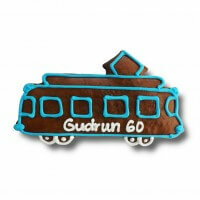 Made of the finest gingerbread and painted with many details of frosting, the tram can be further individualized. For example, you can choose the text, the font color and optionally your logo. That makes this tram something very special! Each gingerbread tram is unique and is made by hand, so shape, color and arrangement may vary slightly.